Bo sposts enemies hidden in bushes from an uncanny distance. Shared with teammates! Bo releases a trio of exploding arrows, tearing up enemies like an eagle’s talons. Predict the enemies movements to use the basic attack effectively. Try to use the Super when there is no enemies nearby to catch them off-guard. Use his Super in the choke points or high traffic areas. It could bring huge value when target multiple Brawlers at once, providing an insane map control. Planting mines in the grass is another effective way to weaken the enemies before you kill them. Note: This guide is a bit obsolete! Bo has decent health, which can be useful for tanking enemies from far away, that is why he is a very good support/type class. His arrows are splash damage and can cover the whole entrance points on most maps (which prevents enemies from pushing too hard). Each arrow that touches you is 100 less health, and since the arrow hitboxes are big, it will most of the time touch you. He is very good with a decent team, but may struggle to carry the game alone. Bo’s main area of expertise, however, is his ability to easily control “choke points”. For those of you who are unfamiliar with the term, it basically means a part of the map which the enemies will constantly have to pass through.) Like I said before, he can cover entrance points very well and he is considered dangerous. This is evident in his regular and super attacks, with his regular attack being able to fire a spread of explosive arrows into a small gateway and his super allowing him to place a trio of mines in a choke point, possibly killing more than one enemy at once. Bo’s primary attack (Eagle-Eyed) shouldn’t be hard to use. When you move right, the arrows spread more and cover more distance, which is why he can cover most choke points. If you move left, he shoots his arrows directly in front of where you aimed, like Colt or Ricochet. 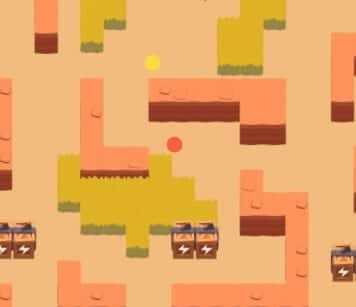 Don’t try using the left method (where arrows shoot directly) against fast moving targets like Crow or Mortis, as they will most likely evade all of the arrows. Instead, use the right method (where arrows spread more) as it covers more distance and will guarantee at least 1 arrow to hit. Bo’s main game mode, where he excels the most. He is very good at defending, but not at attacking, therefore I recommend taking control of the center so he can keep defending for the whole game. They would have to either kill you or make you move back or kill the high damage guy in your team (such as colt, shelly, spike, etc). For a very good defending team, I’d recommend having a Piper who can also cover choke points. Enemies would have a hard time dodging both you and piper’s deadly bullet. Bo does well in bounty. This is simply because of the excess of choke points in each of the maps. Think about this. The only map that doesn’t have any chokepoints is Shooting Star. As you can see, Bo will so well at controlling the choke points relatively well in most of these maps, including Temple Ruins, as it all depends on how well you play and where you place the mines. Bo will also do well at defeating groups of enemies, which will happen a lot in Groundhog Burrow and Temple Ruins. When using Bo in all maps except shooting star, the best thing to do is control the choke points, defeating or scaring away brawlers attempting to pass through the specific choke points. As long you consistently do this, (and your teammates are half decent…) you should be fine. Don’t even bother using bo in Heist. 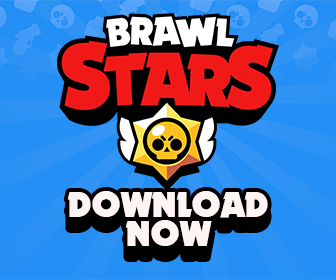 Bo may sometimes work on Brawl Ball, but I wouldn’t recommend using Bo here either. On Brawl Ball, you have to be able to both defend and attack well in order to ensure the team’s win. The only part where walls are close together are the scoring camps which might make it easier for you to hit the target, but he doesn’t deal enough damage to stop tanks like Bull from scoring a goal. You can always put mines near your base, but that would break the boxes protecting the scoring camps. You could try using the mines on the enemy base in order to break the walls, but the enemy might not always step in them. He could probably work out here somehow, but I’d rather go with another brawler. Unlike what most people say, Bo can do really well in Showdown if played well. It’s all about annoying your enemies by spamming those arrows from a fair distance. I know, those maps are usually better for close range types like Shelly or splash like Dyna. But guess what, Bo is a splash user too! In order to ensure survival in Showdown, make sure to take advantage of the walls and the distance between you and the enemy. If up against any close/mid range character (Shelly, Spike) NEVER get too close to them. Always keep a good distance. When you get the mines, put them at the center of the map, since it’s basically the only way to make mines work in Showdown, if you don’t get enough for your ultimate (mines), don’t worry, they aren’t really that important here. Always focus on dealing random damage to enemies, but don’t engage too much as of to kill them. 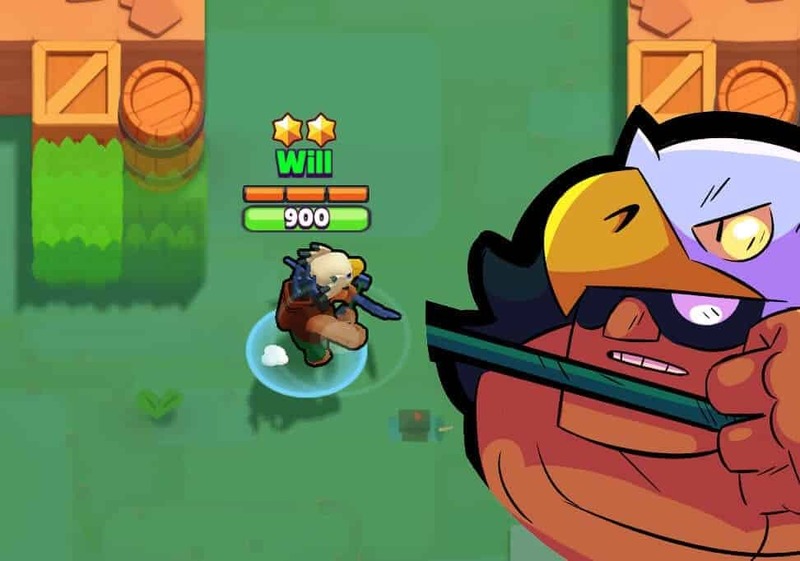 The Red dot reprents you (The Bo) and the yellow one represents the enemy, lets use El Primo as an example. When attacking El Primo, keep the distance showed in the image, if he moves towards you, move back. If he runs away, chase him unless he goes into a closed space. Let’s say El Primo is at 300 health, and you are still at 800, he is in a medium space. Would you go get him? If you said yes, think again because the answer is no. You rarely kill any tank here. Your main objective in Showdown overall is to just annoy the enemy and keep dealing damage. But the one who gets rid of your enemy is in fact, another player. Again, you is the red and enemy is yellow. Your enemy is just at 100 health, he is running away to mid. Stop! Don’t chase him, especially on the part of the game where the green smoke already covered most of the map leaving mid and some corners alive. Since your enemy is low, another player will try to kill him. Enemy is Shelly, another player is Spike. If Shelly knows she can’t escape Spike, she will try dealing some damage before dying. That’s when you step in and get 2 in 1. However, this won’t happen. Instead, you will get at least 2 other players trying to kill that Shelly. When they are close together, spam those damn arrows and keep dealing damage from far away. I must warn you though, Bo is not made to be the first place in Showdown, so you’ll get average 4-2 place every round. This would conclude my guide for Bo! Thanks for reading and as always, have fun! How’s it going guys? It’s MJF here with my first ever guide on Brawl Stars! Today, we’re going to talk about Bo’s strengths, weaknesses, strategies, game modes, and battlefield role. He has a base attack of three exploding arrows that shoot with a spread slightly smaller than Shelly’s. Each arrow does 80 base damage, increased by 4 every upgrade. Bo’s Super drops three hidden mines onto the battlefield, that are triggered when an enemy steps on top of them. These mines do 300 base damage each, upgraded by 15 for every upgrade. Being a ranged Brawler, Bo is very strong when engaging enemies from a distance. He can outrange most brawlers, besides Ricochet, Piper, Brock, and the Sniper with a Shotgun :). This allows him to effectively harass enemy Brawlers without putting himself in too much danger. For the Brawlers that can outrange him, his high hit points mean that it will take a long time for them to take him out, particularly when he hides near a wall or some type of cover. Perhaps his greatest strength is the immense map control he provides. His basic attack has a nice spread that can easily hold off choke points or clear bushes, and his mines can block off entire sections of the map from the enemy team unless they want to take 900+ damage. While Bo’s attack is quite strong overall, it lacks a lot of reliable damage. His single-target damage is not very high, so it will be very difficult to pull of clutch plays at the end of a match, and you will want a Brawler with a higher damage output so that as Bo you can focus more on harassing and finishing off enemies rather than dealing all of the damage. Additionally, as a more Support-based Brawler it can be difficult in random matchmaking if your entire team is support Brawlers or play really badly because you need another skilled Brawler to support in order to do the job you are optimised for. In my opinion, this is Bo’s strongest game mode. His amazing map control allows you to control where the enemy will move, which allows your team to more easily take control of the gem mine. By placing your mines at the center entrance of the map Bone Box, you can prevent the enemy team from getting to the center without taking massive damage, or just place your mines directly on the gem mine to force them to take damage if they want a gem. Due to his relatively high health, as Bo you can take on the role of grabbing all the gems and holding them while providing backline support for your team. If you have a Mortis on your team, let him take the gems and instead pressure the opponents away from him using your explosive Arrows. Like most ranged Brawlers, Bo excels in this game mode. In maps with lots of choke points such as Terracotta Square, his mines come in handy to block off entrances the enemy must use to get to you, and on opens maps like Shooting Star he is great to stay out of range of the enemy and shoot away with ease. The most important strategy here is to stay at long range, unless you must chase down an enemy that has lots of stars and you do not. Bo is an interesting pick for this game mode. He is quite effective on defense because his mines can block off the pathway to the safe, and you can just spam his arrows towards any choke points to delay the enemy. However, when attacking you have to be very strategic. First, charge up your super to place the mines in front of any walls blocking the safe. 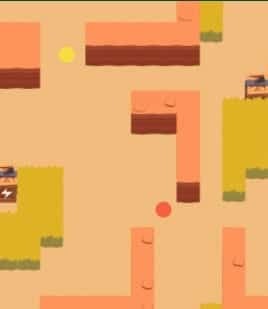 Usually, the defenders will stay near this wall, so they will trigger the mines and break the walls which allows your team to shoot directly at the safe. Once this is done, focus on always placing your mines right on top of the safe. Every time an enemy walks past the safe, they’ll explode the mines and deal 900+ damage to the safe. If they don’t see you place these mines this is a super funny way to finish off a damaged safe. Unless you are very confident, I wouldn’t advise using him in Showdown. He’s not too great in 1v1 situations due to his relatively low single target damage, so he doesn’t do too well here. It also takes a long time to destroy the Energy Boxes so this puts him at a disadvantage. Also, you can place your mines in a choke point on the map, then engage a player and retreat to them. The enemy will walk right over them and take lots of damage which should allow you to finish them off. One of the most important things to know in Brawl Stars is the role your character should be playing in battle. It’s pretty clear by now that Bo is a Support/Harassment Brawler that can act as a decent tank in a pinch. Always remember to keep pressure on your opponents and make sure to use your mines with good placement! It can be tempting to place them right on a Brawler as they chase you but it’s better to save them for another time. So that’s about it for this guide! As I said this was my first guide, so let me know what you think of it in the comments down below! I don’t currently have the means to upload pictures into the guides but if that’s something you would like to see added here tell me that too and I can probably make it happen! Also, feel free to suggest what guide(s) I should write next, I’m always open to comments or suggestions :).